When we spoke to choreographer Kim Brandstrup earlier this year we were intrigued by his ongoing project with The Royal Danish Ballet, a company we have been lucky enough to visit recently. Kim was working on two matching ballets, one all-male, another all-female which would premiere days apart in different mixed bills. When we found out dancer Carling Talcott (whose fantastic blog Mixed Nuts you should definitely read) would be watching the all male M/K Danseur Noble program from the audience’s side of the curtain we asked her to guest blog about it. Luckily for us she agreed. What follows, as Carling says, is “not meant to be a review” (since Carling is a dancer with the company), but merely her “observations on the men of The Royal Danish Ballet”. My first year as a corps member of The Royal Danish Ballet is coming to a close. We are in the midst of performing our final program of the season. Dubbed “M/K” (short for “mænd/kvinder,” which translates to “men/women”), this program has a unique premise. 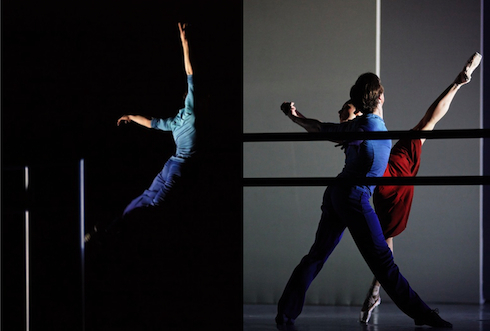 With a run of twelve performances in all, half of those are M/K Ballerina and half are M/K Danseur Noble. What does this mean for the audience? Depending on your mood, you can choose to see mostly ballerina ladies one night, or mostly men in tights another night. I, obviously, am part of the “Ballerina” half of the program, and get to perform some fantastic stuff, George Balanchine‘s Serenade, my personal Holy Grail; Jerome Robbins‘s The Cage, in which I unleash my previously-unrecognized inner man-eating bug; and a Kim Brandstrup world premiere, Eid♀lon. This program also offers me a rare opportunity: on the “Ballerina” nights off when the boys take the stage, I get to be a member of the audience and simply sit back and enjoy the show. After the ladies’ turn on Thursday night, the M/K Danseur Noble program held its premiere the following evening. A Friday night off for me, I decided to head over to the Operaen and flash my Det Kongelige Teater pass to watch the men strut their stuff. Also, I’ll take any chance I can to put on a pair of high heels. And any chance to get into the ballet for free. Going into the performance, I was excited and nervous for my guy friends; because of our unusually segregated rehearsals and overlapping schedules, I had only seen one of the pieces on the program. It was an odd sensation taking my seat in the massive new opera house and settling in to watch the company perform. Truth be told, I felt a little frantic, like I had possibly missed an important memo (in Danish, naturally), and instead of sitting pretty in a red velvet seat I was really supposed to be backstage warming up, taming my hair into a ballerina updo, getting frustrated with my inability to put on fake eyelashes in anything less than three tries, etc. etc. Personal neuroses aside — I had not, in fact, missed any message in any language — I took my seat and prepared for three hours of manly dancing. The lights dimmed, the conductor and orchestra entered the pit . . . and the curtain did not rise. I was intrigued by the setup as it became clear that this was not going to be your mormor’s (grandmother’s) Bournonville. This is Bournonville in dark territory. The piece begins with a violinist stepping onstage to play. Moments later, new principal Ulrik Birkkjær enters –not from the wings, but presumably, from the door leading to the backstage area. Clad in a dark trench coat, baggy pants, and oversized untied combat boots, he strolls in casually. I think/hope such footwear was inspired by our boss, Nikolaj Hübbe, who is often seen wearing a fantastic pair of huge black boots. I love them. One by one, the other boys file in, all wearing outfits similar to Ulrik’s, greeting each other with “bromantic” hugs and pats on the back as the violinist continues his beautiful sort of introductory melody. The music inspires the boys to dance and seconds later they shed their layers of coats and boots to reveal costumes in shades of grey. The wardrobe and set choices achieve a gothic, Edward Gorey-esque look. It’s in stark contrast to the traditional atmosphere of Bournonville and provides a unique setting in which to show off the buoyancy and lightness so commonly associated with this particular technique. As Ulrik begins his solo, the wings and backdrop descend, the Bournonville quotation sign rises into the rafters and the sets appear. What follows is a jaw-droppingly impressive display of the Bournonville technique, and of the wide-ranging, deep talent of The Royal Danish Ballet men. 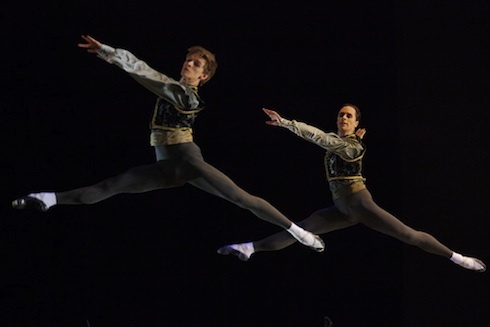 They execute combinations drawn from the Bournonville technique class (ingeniously set to Bournonville syllabus and strung together by principal dancer Thomas Lund to form one piece, with music arranged and orchestrated by Martin Åkerwall). I watch my colleagues jump with the ease and lightness so characteristic of the men in this company; their relaxed upper bodies, rapid-fire footwork, and steely control of movements are beautifully exhibited in this show of Danish bravura. Lund has created the perfect way to introduce Bournonville to new audiences, combining the updated look of sets and costumes, plus a new score; with carefully chosen combinations from the class repertory. In an inspired coup de theatre Lund has the stage go black, save for the boys’ feet, their socks and ballet slippers having been sprayed with a special UltraViolet paint to create a blacklight effect, so all the audience can see is a dozen pair of men’s feet, executing near-flawless petit allegro steps in gorgeous synchronization. Seeing my friends perform with such technical precision and non-stop energy made me proud, for The Royal Danish Ballet has a long-standing tradition of producing great male dancing; and this opening performance reminded people that this stands true today. The audience responded with wild appreciation – most well-deserved, in my (slightly-biased) opinion. There was a short pause following the first piece, and then the lights dimmed again for José Limón‘s The Unsung, a piece without music. I was especially excited to see it because I had heard so much about it from the guys involved, had seen maybe three seconds of a rehearsal, and had thought that the whole idea of a performance with absolutely no music was fascinating. As a dancer, my favorite part of any performance is the correlation between the choreography and the music, and finding new ways to phrase steps and highlight musicality. This seemed to present unique challenges. The curtain rises to a circle of men, shirtless and barefoot, clad only in muddy brown loose-fitting pants. They stand facing each other with their fingers outstretched, one hand on their foreheads, the other behind their heads. The men switch their weight from one foot to the other, on the balls of their feet; the only sound you can hear is that of their pants swishing back and forth. In perfect harmony, and perfect silence (save for a few audience members who could have definitely used some cough drops and the inevitable mobile phone interruption), the boys execute a series of steps that are tribal in influence and very physical in nature – you can clearly hear the balls of their feet as they hit the floor, especially in the acoustically-advanced Opera house. I bit my nails as Constantine Baecher, a corps member and very good friend of mine, threw his well-toned frame to the floor with abandon, and winced in sympathetic pain as he banged the tops of his arches against the floor so that the sound of bone-meets-marley echoed throughout the Opera. His solo was the first of several and all of the guys, soloists and corps, performed this piece with every ounce of energy in their bodies. Each of these men, with whom I work and joke around with and see every day, blew me away. It was clear that they had formed a bond rehearsing this piece; that they all understood something deeper about the choreography and respected the work and rehearsal process so much. I felt like I had just witnessed something truly unique and very, very special. The third piece of the night, Peter Martins’ Les Gentilhommes, was a complete 180º shift. With a score by Georg Friedrich Handel, it begins with nine men, in white from head to toe, standing in fifth position, facing the audience. It is an elegant, clean image; the crispness of the all-white costumes against the simple dark backdrop immediately tells the audience that the piece will show off “les gentilhommes” in a similar light. The refined score mirrors the gentlemanly movements the men execute. 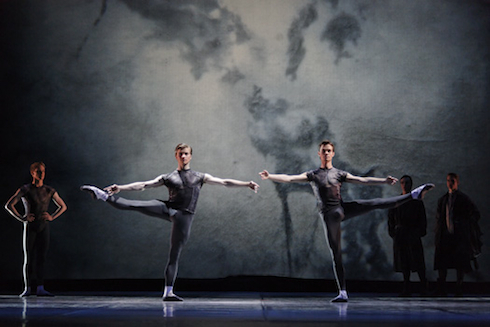 Comprised of three pas de trois sections – sandwiched by two ensemble parts with a solo for the principal male (this night, Energizer bunny Ulrik Birkkjær again) – the ballet does not showcase tricks or explosive movements, but instead forces the guys to display a sense of manly, understated grace or, according to New York City Ballet’s website, to convey the manner of “18th-century courtiers.” Whereas The Unsung highlighted extreme physicality and testosterone, Les Gentilhommes displays nuanced choreography and a subtlety of movement normally not associated with bravura male dancing. The white tights are a genius choice. The men’s legs and feet look so long and toned, and the clean lines of this company’s men are made even clearer as a result of the costumes, and they were extremely flattering to my friend, corps member James Clark, who has legs up to his ears. While watching, I noticed a unique emphasis on port de bras, especially for male dancers. So often today in male dancing the focus is on legs and feet, or acrobatic feats, or over-the-top tricks; it was nice to see a group of men showing a supreme ease and elegance by just moving their arms and upper bodies. I paid special attention to this detail since I have been working on becoming softer in my upper body. Another bonus of watching performances as a dancer is being able to watch others in a way that helps you focus on your own dancing. The piece ends with the nine men on one knee facing the corner, arms outstretched; to the sweet sounds of Handel, Ulrik does a controlled, beautiful double pirouette-double à la seconde turn, to end in the same position as the corps one count later. My friends and I were happy to give them “bravos” both for their performance and for looking so good dressed in all white. That in and of itself is a major accomplishment. Plus I had to hand it to the guys: Sebastian Kloborg and Marcin Kupinski performed the first three pieces in a row; these guys were working for their upcoming three-day weekend. But the best part is you wouldn’t know it at all (I work with some majorly in-shape people, let me tell you). 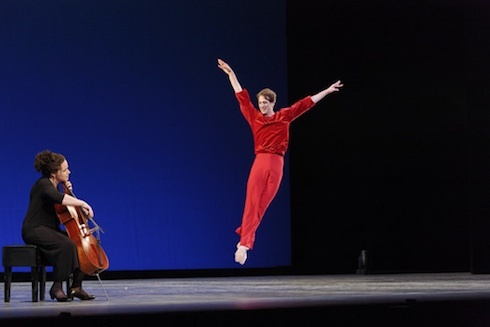 Jerome Robbins’s A Suite of Dances, set to achingly lush music for cello by Johann Sebastian Bach and originally choreographed on Mikhail Baryshnikov in 1994, was danced by Nehemiah Kish. Nehemiah (or as I call him, “Kish”) will be leaving RDB after this season to be a principal dancer with The Royal Ballet, and this piece made me realize all over again how much he will be sorely missed. The curtain rises and Kish is sitting on the ground, wearing a red velour sweatshirt with red pants, looking up at the cellist standing in front of him. After a moment, both cellist and dancer walk to their places — the female cellist that evening sat in a chair downstage, while Kish began the piece standing upstage. The first notes to come out of the cello are indescribably expressive and moving; the sound is so full and wonderful. And with that Kish begins a veritable marathon. Onstage alone for the duration of the piece, he proceeds to dance virtually nonstop in a series of four dances, to four movements from Bach’s Six Suites for Solo Cello. The movements are whimsical and easy — at one point he shakes his hips; at another he does a somersault — and the entire piece has an intimate, carefree sort of feel to it. It’s short, sweet, and to the point: just a guy in a studio, dancing around to beautiful music. I love the sparseness of the stage, and the blue backdrop against Nehemiah’s bright red costume and the light, almost orange-brown tint of the cello makes this a bright, easy piece to enjoy. Kish executes the deceptively complicated combinations of steps with a boyish ease, and the role (often performed by shorter guys) suits his tall height and lets his relaxed stage presence shine through. Over the last ten months, I’ve been a fan of Nehemiah’s dancing; the first role I saw him perform was Tony in Robbins’s West Side Story Suite, earlier this season in our first program. Watching his easy-going, care-free performance on Friday, I was reminded of this; he brings the same youthful energy to this work as he did in that role. He makes the complex choreography seem like a piece of cake, and hides any signs of exhaustion in a work that clearly requires a whole lot of stamina. Kish’s dancing will be missed, and the audience’s enthusiastic response to his performance indicated as much. The cellist also received a warm reception, as well she should have: She played Bach’s music with emotion and brought life to the composition. The evening ended with Eid♂lon - the world premiere of Kim Brandstrup’s piece for the men, set to new music by Kim Helweg (and yes, I did find it awesome that both composer and choreographer were named Kim). As a member of the girls’ world premiere piece, I was really interested to see the boys’ version. Kim Brandstrup used the same score, set, color scheme, and concept for both the ladies’ and men’s pieces; he gave both the same title, switching the gender signs accordingly. We had separate rehearsals throughout the process, and the orchestration of the score differed slightly; but other than this, the boys’ piece was, from what I had heard, a male version of ours. I was excited to see how that would translate to the stage and to figure out which of the guys did the same spot as I performed in the ladies’ version. It was a bit surreal to see the choreography the other girls and I had performed the previous evening (obviously adapted a little bit for the men; they’re not in pointe shoes . . . or dresses, for that matter) done by men, with my spot done by my friend Mads Eriksen. The piece starts with a blue barre downstage, and a division of the stage into a grey room and a white room. 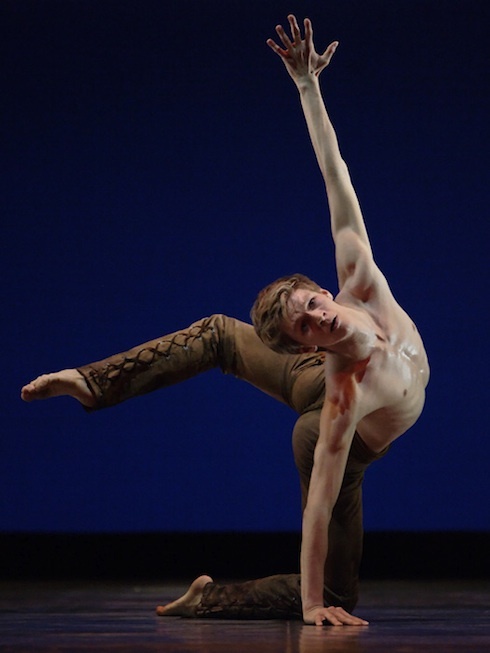 One of my good friends in the company, Alban Lendorf, was the principal male (he is also Ulrik’s second cast for Les Gentilhommes; and has a soloist role in Bournonville variationer). Alban begins staring into the white room; staring back at him, in darkness with a video projection of television static as the background, are the rest of the men. It is a creepy, haunting sort of image that indicates the introspective, reflective atmosphere that I get both from performing and from watching the piece. Throughout the work, the dancers in the white room mirror the movements of those in the grey room. Mostly in pairs, they perform the contemporary movements with energy, and occasionally Alban defies the laws of gravity (So if you’d like to witness minor miracles of science, I recommend this program.). Amidst a sea of blue costumes corps member Alba Nadal finally enters wearing an orange dress; as the other men leave she and Alban dance a nostalgic pas de deux (yes: The similarity of their names is occasionally problematic.). At one point, he walks away from Alba, goes to the barre and faces the audience. She comes up next to him, and in an almost protective way, leads him through the same steps as he had initially led her. It’s a quiet, almost melancholy end to a wonderful evening of male dancing, and when the curtain comes down at the end of Kim Brandstrup’s piece, it seems like the audience had enjoyed the entire night just as much as I had. I love it when guys get to take the stage for a while without any gals on stage. Often, the stage is so completely dominated by female dancer that I am wondering if ballet should even be a guy thing at all. Seeing males take over for a bit reminds that guys aren’t just second fiddle. How lovely, wishing your granddaughter best of luck. We heard that RDB will be taking this Brandstrup piece on their 2011 tour of the USA, along with Johan Kobborg’s new ballet. We’re looking out for details too and may have to go on tour ourselves!